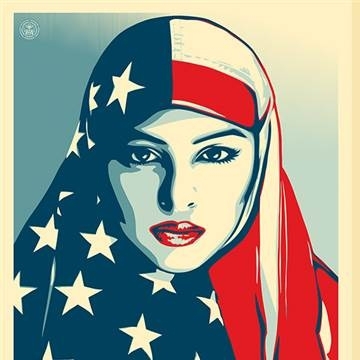 This image, evoking the Obama Hope poster, appeared during the women's march. Among the most controversial organizers of the "women's march" on Washington earlier this month was Linda Sarsour, executive director of the Arab American Association of New York, and a longtime supporter of Islamist groups, leaders and causes. While Sarsour's progressive allies at publications like The Huffington Post sought to portray criticism of her as inspired by "Islamophobia," even the New York Times challenged the activist's support of Islamist patriarchy: "Linda Sarsour is a religiously conservative veiled Muslim woman, embracing a fundamentalist worldview requiring women to 'modestly' cover themselves, a view which has little to do with female equality and much more of a connection with the ideology of political Islam than feminism." Next month Sarsour has a speaking engagement on her calendar that further reinforces this narrative of her valuing deceitful Islamism over authentic multicultural liberal tolerance. On February 18 Sarsour is scheduled to speak for the Council on American-Islamic Relations' (CAIR) Georgia chapter. She is set to appear with CAIR founder and executive director Nihad Awad and CAIR-Florida executive director Hassan Shibly. Shibly's anti-gay, fundamentalist views have been known for years. In a 2009 Facebook writing he described homosexuality as "evil" and among "quick ways to earn God's wrath..."
A Facebook screenshot courtesy of Americans for Peace and Tolerance. Standing alongside hate preachers at CAIR's fundraising events is not anything new for Sarsour, of course. In 2012 she appeared at the national CAIR chapter's "Leadership Conference & 18th Annual Banquet" with Siraj Wahhaj, one of the most unapologetically anti-gay Islamist imams in America. Sarsour surely cannot play this duplicitous game forever. She cannot march alongside gay rights advocates and feminists one month and then speak and schmooze with Islamist homophobes and misogynists the next. With moral contradictions like these on full display, people might eventually develop the impression that she doesn't actually believe what she's saying.